Flurbiprofen is an ophthalmic solution that is used on pets to treat certain kinds of inflammation, itchiness, or redness in the eyes. The eye treatment solution is easy to administer and it can be applied on both dogs and cats. Use the simple eye-dropper to quickly treat your dog's or cat's inflamed eye, and you will see a marked reduction of eye redness. 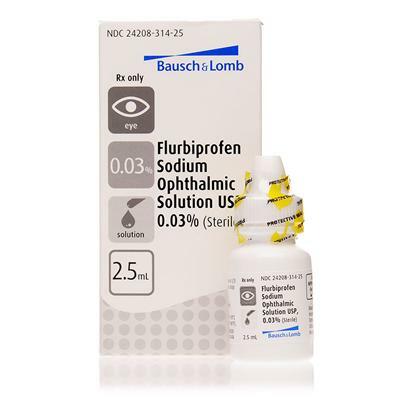 Flurbiprofen Ophthalmic Solution works to counteract the substance that causes a painful inflammation of the eye, which is called uveitis. These eye drops are effective in relieving redness and irritation. They are non-steroidal eye drops and can improve the side effects of uveitis, which include redness, itching and puffiness. It's time to give your pet a soothing escape from the painful irritation of uveitis eye inflammation and treat their red, itchy eyes with proven Flurbiprofen ophthalmic solution. Keep out of reach of children. Not for use in pets with glaucoma. Will cause decrease in pupil size. Talk to your vet if your pet experiences any unusual symptoms. Be sure to inform your vet of any medications your pet is taking. Administer drops as directed by your veterinarian. Wash your hands before and after using this medication. Do not touch your pet’s eye with the tip of the dropper.